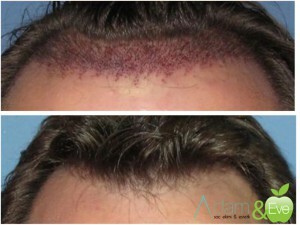 FUE hair transplant normally requires the donor area to be shaved prior to extracting each individual hair follicle but the latest news is that Follicular Unit Extraction can be performed without shaving the back scalp. This is called the Non Shave /No Cut FUE method. You hair fall down, thinned out, or the front line went back, you may feel uncomfortable with the way it looks, and you want hair transplantation, but don’t want to lose the length of your hair. However, traditionally, doctors performing this type of procedure shave the patient’s donor area in order to harvest each individual graft…one by one. This has not been an easy experience on patients, creating embarrassing moments from being seen in public with a half shaved head, or worse, having to take time off in order for their hair to grow back in the donor area. Trichologist Safiye Kurt, Founder and hair transplantation specialist of ESTEVIP, is proud to announce the implementation of the No Cut FUE method of hair transplantation. From donor area we will separate the hairs with a special bandage and cut it small line with 7-8 cm of length and 2-3 cm of thickness. And from this area we harvest grafts with high concentration using a micro motor, and transplant them to the recipient area. After removing the bandage no one will notice or be able to see neither donor area nor transplanted area. With No Cut method, it’s possible to transplant between 1000 to 1500 graft. If this amount of graft won’t be enough to cover the empty area, patient will be needed a second session. ESTEVIP, the method of NO-CUT has been practiced for year and by professional. If you chose this method please take a look at picture of former patients before and after results, who has done the NO-CUT method of hair transplantation before, and let your hair be analyzed and make sure that you need hair transplantation. Hair transplantation specialist can select, one by one, the strongest and best hairs to harvest, including hairs with the ideal curl and/or color, since they are being chosen one by one in their original length.